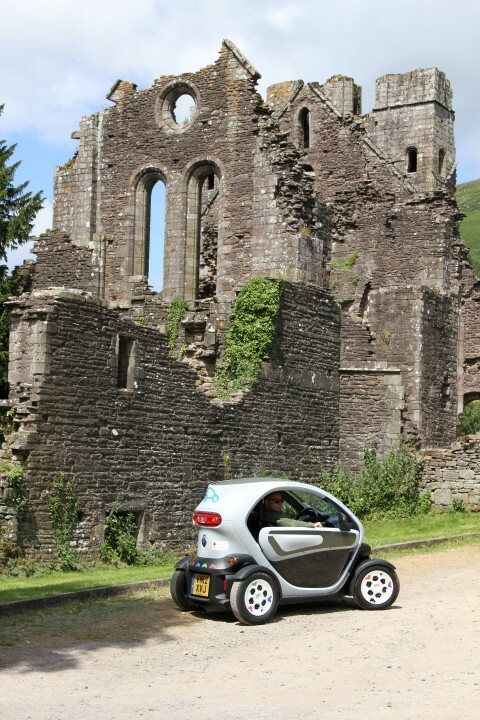 Steve and Annabel, owners of Baddegai holiday cottage took a trip in our new electric car, Tomos around the Brecon Beacons and wrote a blog post for us. If you fancy a go, give us a call on 01874 676446. 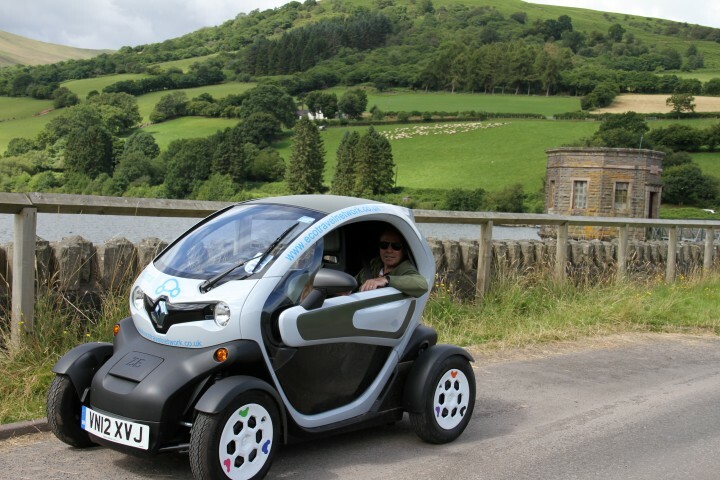 Having read about the Brecon Beacons Holiday Cottage electric car, Tomos, we decided to have a day out in him – an alternative way of seeing the beautiful Breconshire countryside – from a slower and lower position to normal. We picked him up from their office just outside Talybont and were given full instructions on how to get the best out of him. We were also provided with a list of places where we could plug him in though frankly as his refuelling cost is about 40p I think most pubs and cafes would be happy to charge him up if you were having lunch there, as long as they had a convenient plug socket. Firstly we went up to Talybont reservoir to give him a test run on some quiet roads. He was amazingly easy to drive and oddly enough I did not feel unsafe when passing bigger cars – in fact his size was very handy when coming across people going in the opposite direction down narrow country lanes. The reservoir is a beautiful spot and we took the opportunity to stop and walk our dog Portia along one of the many forestry tracks that zig zag up from the side of the water. 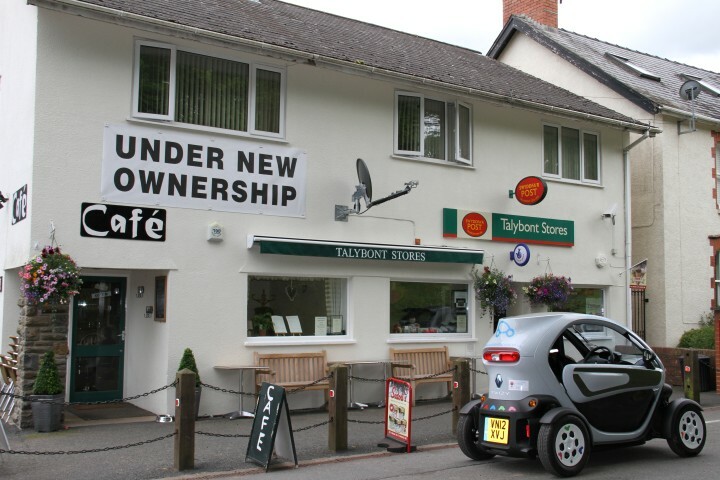 Then it was down in to Talybont village where we stopped at the two advertised ‘fuelling points’ – the village stores and Star Inn pub. Both were very welcoming and would have been happy for us to plug in had we needed to. From previous visits we know that both serve great food but we had a schedule to follow so a quick drink was our only form of refreshment. We took the back road to Crickhowell following the Breconshire and Monmouth Canal and then we headed north east along winding country lanes to Llanthony Priory. This is a beautiful spot and well worth the trip – a small inn sits within and is actually part of the original 12th century Augustinian priory. Unfortunately we could not get Tomos close enough to an electric point to be able to plug in so could not justify stopping for lunch. We headed up to Hay-on-Wye – and ‘up’ it certainly was. The only problem being that as Tomos went ‘up’ the hills the gauge displaying the battery power went ‘down’ very quickly. Luckily we managed to get to the top and as we coasted down in to Hay we realised that Tomos is clever enough to charge himself on downward journeys. Having said that, The Swan at Hay was a very welcome site and the staff could not have been more helpful. We plugged in Tomos and whilst he took on nutrition so did we in the form of a lovely lunch in the bar. Having drained him nearly dry it did take Tomos a while to refuel so we took the chance to have a wander around this lovely town, browse in a few of the well known bookshops and take advantage of a Rohan sale to buy a jacket – sitting in the back of Tomos can get a little chilly with the wind whistling in both side windows! 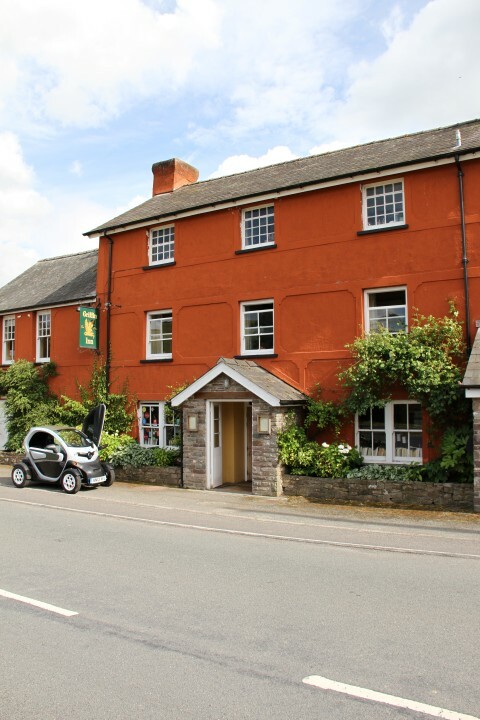 From Hay we followed the Wye along to Glasbury and popped in to the River Cafe to make sure they would have known what to do if we had needed juice – no problem here or at The Felin Fach Griffin where we gave Tomos a top of juice having found the plug socket in the hedge! From here we took the A438 and A40 back to Talybont getting up to Tomos’ maximum speed of 50 miles per hour at one point! Even on these busy roads we didn’t feel worried by the bigger vehicles around us – it feels bigger inside than it looks from the outside! That said you have to be quite agile to get in and out from the back position as the front seat does not fold forward and for long days out like we had a slightly more padded seat would be very welcome. We arrived back at BBHC feeling like we had had really had a great day out and a different one at that. Everywhere we stopped people were hugely interested in Tomos and we had many people saying how much they would love a go – he looks as fun as he is!